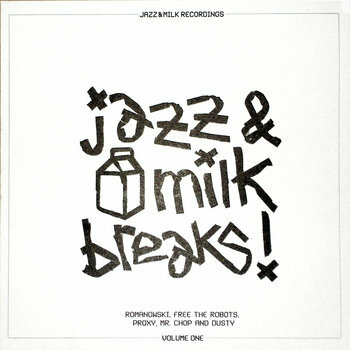 THE COLOURFULLY MONIKERED ROMANOWSKI, FREE THE ROBOTS, PROXY, MR. CHOP AND LABEL BOSS DUSTY HAVE PUT TOGETHER A QUINTET OF SOME OF THE FINEST JAZZ FUELLED BREAKS I`VE HEARD FOR MANY YEARS. "JAZZHOLE" IS A 40S MEETS NOUGHTIES, PIANO-LED BREAKBEAT SMASHER, "SNOB" HAS A HAUNTING MIDDLE EASTERN FLAVOUR WITH A LITTLE JOHNNY HARRIS STYLE FLUTE ACTION THROWN IN FOR GOOD MEASURE; AND ELSEWHERE, "FLAGRANTI" IS STEEPED IN PERCUSSIVE MADNESS, "THE ART OF LEISURE" IS AN EPIC PIECE OF HEAVYWEIGHT FUNK, AND DUSTY`S "EXLOSION" BRINGS THINS TO A APPROPRIATELY DRAMATIC CONCLUSION. AN ESSENTIAL RELEASE FOR JAZZ AND BEAT HEADS ALIKE.